Preheat the frypan or BBQ grill. Cut the cheese into 16 chunks. Peel the red onions and cut into slices the same size as the cheese. Cut the capsicum in half and discard the seeds and pith. Cut the capsicum and zucchini into the same size chunks as the cheese. 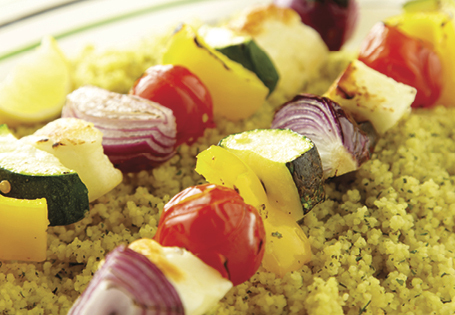 Thread the tomatoes, vegetables and cheese chunks onto the skewers – 2 of each per skewer – brush with a little olive oil and season with salt and pepper. Grill or barbecue for 5-6 minutes on each side. Serve with couscous, prepared as per instructions on the pack.